Really quite a boring poster for such a BIG film. If you’ve read two reviews of this film by now, one of them said that Avatar is more a technical achievement than a cinematic work. And that’s true, but it’s more than that too. For those living under a rock Avatar is the new film from James Cameron of T2, Aliens and (begrudgingly) Titanic fame, and apparently it has been over a decade in the making while Cameron waited for technology to catch up with his vision. I went to a 3D session, plumped the buck for the too big non-sunnies and sat there for the better part of three hours in a seat perhaps a metre or two too close to the screen so I got a sore neck in the deal from trying to catch everything, it was like watching a tennis match at times with the big screen. I also made the mistake of buying the supersize coke, (which is a mistake at the best of times), so the last 90 minutes was legs-crossingly frustrating and made it a little hard to focus. First things first… Avatar looks awesome, from the opening sequence where all the soldiers awaken from stasis and float around in zero gravity getting both their bearings and their stuff together through to the credits, your eyes will have a feast even when the plot plods a little. The special FX in the main look flawless, the only thing that kept catching my eye as being even a little foreign looking or out of place is Sigourney Weaver’s creature’s clothing, that seems obviously fake. It is hard these days to be inventive and come up with new fantasy creatures and not be compared to either Star Wars or Lord of the Rings, as both pretty much set the bar cinematically for this generation. For the most part though the host of new beings on display are fresh and new, though the horses seem too “horsey”, and even make the same noises. It basically seems that the theme was “let’s make these fantasy creatures, and if the designs don’t look foreign enough just double up on something!” So creatures that would ordinarily have 4 legs have 6, many creatures have 4 eyes, and in the case of the horses: gills, even though they don’t go underwater. But enough about how Avatar looks, I’m sure that the studio mentioned if you spend 500M on something it better look pretty fresh and new. From my perspective I don’t care how much the thing cost and I can’t see why anyone not physically forking out the dough cares. Avatar is set in next century, humans have fucked over Earth and are seeking sources of energy, something that the moon called Pandora has in abundance. The catch is that the moon is quite thickly forested and inhospitable, and hosts a plethora of unique creatures and races, the most notable being the Na’vi, a race of 8 ft + blue creatures which move with exceptional grace and speed, and who respect the environment and live alongside it, rather than despite it. So in an effort to move the Na’vi along to allow we bastards to harvest the precious energy source, inexplicably and stupidly called Unobtainum, scientists have developed synthetic Na’vi replicas that they link up to human hosts, that enable them to meet and exist in the non-breathable atmosphere, and ideally talk the Na’vi into moving down the road to new digs. The humans use these initially inanimate hosts called avatars (natch), by hooking up with them using a system of wires and what appear to be hyperbaric chambers, while the host is plugged in he is unaware of the goings on in the lab, and when he /she is unplugged the Avatar falls lifeless to the ground, which proves inconvenient at times. In what I think was a clumsy move one of the hosts is a guy named Jake Sully (played by John Connor himself Sam Worthington). Jake lost the use of his legs in battle, and is only suitable as the original host was to be his now deceased twin brother, by benefit of his DNA link the purpose built avatar is also compatible to him. Why do we need the twin link? So that Jake can be a rookie thrown in at the deep end, and to justify his military background so…. As Jake goes through the early stages of becoming familiar with controlling his lanky proxy using only his thoughts and mind, during his down time the personification of all that is naughty, Colonel Quaritch is in his ear with the real goss, that assuming the Na’vi don’t want to move on the military are itchin’ to try plan B, assumedly this involves explosions and many blue casualties. Initially Jake is happy being the good soldier and passing on the relevant info to the Colonel, who you immediately know from the first minute he is onscreen that he is a bit of a prick, and will ultimately be around at the end. The Colonel in turn convinces Jake that a brand new expensive pair of walking legs will be his if he plays along. The lead scientist and pioneer in the field is Grace, played by Sigourney Weaver, who has her own Avatar and some direct experience in dealing with the Na’vi, she is the personification of good and wants everyone to “just be friends”. So we all up to speed? Jake is a human driving a 9ft tall blue body into Na’vi territory to try to convince the true Na’vi race to move peacefully, while simultaneously feeding gen to the army so that they can do it effectively by force if talks fail. It is really after the short training phase is over that things heat up. On the first visit to the deep forest Jake is separated from the others after a nifty chase scene involving a giant iguana-looking thing. Left alone and inexperienced in the jungle after nightfall, Grace expects that he is a goner, and indeed it looks that way when he is beset upon by 6 legged jackal/wolfish creatures hunting in numbers on the first night. Only an unexpected Samaritan shows up and single-handedly saves him from becoming lunchie-munchies. Her name is Neytiri, and yes I had to look up how to spell that, she is a Na’vi female played by Zoe Saldana, and is for lack of a better word, pretty hot. From her big feet to her swishy tail to her big eyes she moves stealthily and without sound and with minimal disruption to the environment. (Hear that Al Gore!) Realising that he is onto a good thing here, Jake tags along, as much for his own safety as anything else. Neytiri recognizes immediately that Jake is not one of them but an imposter, and she calls him on that fact early and often, but she also justifies saving him by saying she sees he has a good heart… so that’s something. Long story short, (really long, nearly three hours! 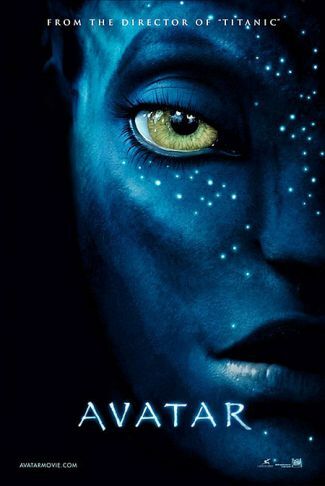 ), Jake is introduced to the Na’vi community and ultimately is accepted into the fold, there are some great scenes involving his “training” by Neytiri, and Jake comes to understand the true nature of the Na’vi and their link to the surroundings and environment. Of course as he becomes more and more pro-Na’vi the big corporations and army get a little impatient and shirty, they take matters into their own hands and decide a full frontal assault led by Quaritch is the best way to go about things. Just why they spent billions of dollars on the avatar project in the first place if they always intended the boom-boom approach is never explained, but it does neatly justify the 40 minute battle that ensues. By this stage though, Jake has been indoctrinated and more than a little p-whipped, so he, along with Grace and a couple of scientists and sympathetic soldiers is part of the blue team. The battle incorporates one of Cameron’s favourite gimmicks, the use of giant robotic outfits to fight other giant creatures, it seems that scale is important to big Jim, in terms of film length, budget and even the size of the combatants. Avatar is not too gory to take the PG 13 crowd, it isn’t too complicated that the non-action fans won’t enjoy it and become involved at points, and even though it is quite long it moves at a pace that you won’t look at your watch too often. Avatar needs to be experienced as much as seen, it is an event, and justifies this by having something for everyone. It seemingly demands that you come for the story, but stay for the effects and the imagery. Every 5 minutes I turned to my mate (Ringworm) and made the “O” expression, often it was a 3D effect, sometimes an action sequence, still other times a move or a new creature, but always something different. Surely that alone is worth fifteen clams? Now I’m calling this a 2010 film, as it came out so near the end of the year 2009 and I saw it in 2010. I still don’t think it will be the best film I see this year but it is the best I’ve seen so far and it will take a good one to beat it. Final Rating – 8.5 / 10. Maybe it’s the 3D glasses talking, in truth this may prove an 8 upon a second viewing, but for now Avatar will have to make do with being the biggest experience that you will have in a cinema in 2009, and likely 2010.